After having run a Beginners Ballroom and Latin class at two Cookham Festivals I decided to broaden the scope and offer classes in other forms of dance at the 2017 festival. I also changed the time of the classes to the evening to give working people the opportunity to attend a class. 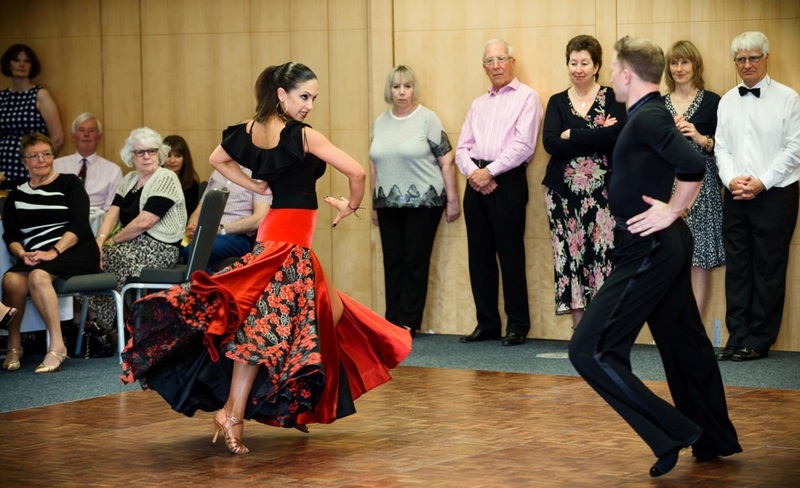 On offer this year were classes in three different styles of dancing: Scottish dancing, Ballroom and Latin and Argentine Tango. The classes met at the Pinder Hall on four consecutive Tuesday evenings and each class lasted for just under an hour. The Scottish dancing course started the evening at 7.00pm. It was run by Ann Montminy, a member of the Maidenhead Scottish Dancing Club. Ann was a fantastic teacher and she got everyone dancing the right steps, in time to the music and with the correct person! Everyone had a great deal of fun and learnt a number of different dances including Highland Welcome and Circassian Circle. After this came the Beginners Ballroom and Latin Class at 8.00pm run by myself, Penny Bysshe ably assisted by my husband Peter. The object of the course was to get everyone to dance round the floor confidently and without stopping. 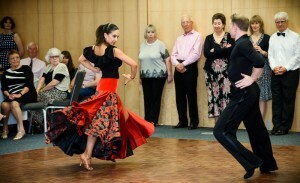 The dancers learnt the Social Foxtrot, the Waltz and the Quickstep in Ballroom, and the Cha-Cha-Cha and Jive in Latin. They also learnt a Sequence Dance, the Barn Dance, which they had fun dancing progressively with different partners. They all made very good progress during the course and by the end everyone had achieved the goal of being able to dance round the floor confidently. The last dance class of the evening was the Argentine Tango, run by Tom Nickson. Tom and his dance partner Denise demonstrated how this sensual and inward looking dance should be performed. Over the four weeks the class worked hard to copy their movements. By the end of the course all the couples had mastered the intricate steps of the short routine Tom taught us which included back Ochos, flicks and embellishments. The highlight of the Dance Programme was the Tea Dance held on the last afternoon of the festival at the Sir Bernard Miller Centre at the Odney Club. The Odney Club did us proud and decorated the tables beautifully which created a great atmosphere on arrival. They also provided us with a magnificent sit down tea which everyone enjoyed after their energetic dancing. Before tea was served we were treated to an amazing demonstration of Ballroom and Latin dancing given by the world class international Ten Dance champions Richard Still and Morgan Hemphill. Their amazing dancing took our breath away. We also enjoyed looking at Morgan’s many fabulous dance dresses. After tea we watched a fascinating demonstration of Argentine dancing given by Tom Nickson and Denise. Everyone agreed that it had been a wonderful afternoon and went home happy with a spring in their step! There really are short cuts to happiness and dancing is one of them!